(90km) – If you have only 3 days but still want to relax then this is the trip for you. 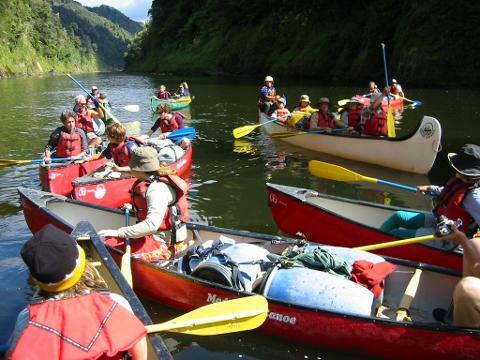 We've had two six person open canoes built to offer three day Whanganui trips in fully guided canoes. These canoes are based on the early Voyageur canoes from the fur trading days in Canada. Comfort on this trip is a priority and it is the little extras that we've added that will make the trip unforgettable. The trip includes excellent 3 course meals, bottled NZ wine, all camping equipment, one night at our pre-set campsite and one night at Bridge to Nowhere Lodge or Cabins overlooking the river. Cruise in style in our Big Canoes. Note- it is possible to book these canoes on our longer trips. They are ideal for family groups.